You may be aware that the group known as “Occupy the Farm” took over a small parcel of land on Monroe Avenue at 10th Street on Saturday. They stayed on the property through early Monday morning, when UCPD evicted them for illegal trespassing on the property. 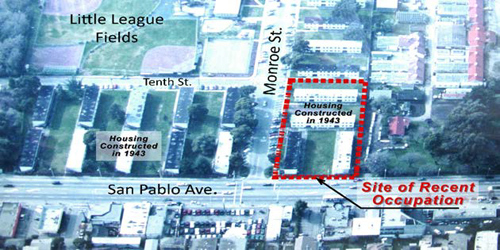 It is unfortunate that this group is unable to recognize the community interests and an almost five-year democratic process that has resulted in the Albany City Council’s approval of a mixed-use development plan for this property fronting on San Pablo Avenue. Further, it is clear that they are also unwilling to acknowledge that the area they claim to be fertile farm land has not, in fact, been farmed in more than 70 years. As many of you know, the property is the site of former WWII-era worker barracks and student housing. We would like to thank Mayor Thomsen and Albany City Council Member Michael Barnes, along with the Albany residents who were present on Saturday and throughout the weekend to oppose the illegal and misguided occupation and to show support for the senior housing and grocery store proposal. We are continuing to monitor the situation and want you to know that our first priority is that the area residents are safe and encounter minimal disruption. We will not allow a permanent encampment on our property, and will continue to work collaboratively with the City of Albany and others to stay the course and fulfill the community desires for development on this site.